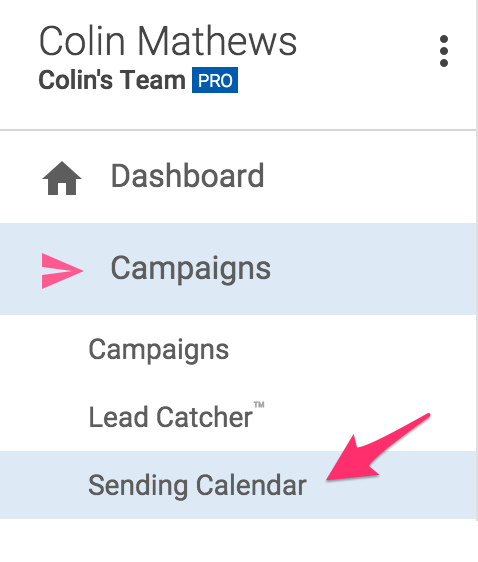 Click on any day of the week to prevent sending from happening (ergo, don't send on weekends). As an example, let's imagine you block out your weekends and have a campaign sent on Friday. By simple math, if you have a follow-up going out 2 days later, that would normally send on Sunday, but Mailshake would bump this to Monday. Choose a time window when sending should occur. Usually you'll want this to be waking hours in your timezone. 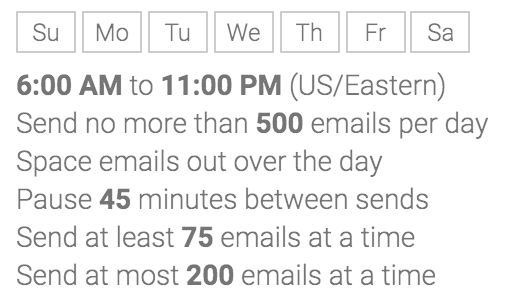 It's a good idea to put a cap on how many emails you'll send in a day. If you have more emails waiting to go out, Mailshake will intelligently space out the various messages as best it can. This may mean a 2-day follow-up gets bumped. Spacing your emails out throughout the day will make Mailshake optimize your sends across the time window you set. Alternatively, you can choose to have emails go out as quickly as possible so you can minimize the delay time between sending a campaign and the emails actually being sent. This setting is mainly for if you're spacing out emails throughout the day. It tells Mailshake to put X minutes (at least 15) between each batch of sent emails. When Mailshake spreads out your emails, this puts a minimum on how many should be sent at once. If this value is low, emails will get spread out thinly throughout the day. If this value is high, emails might not fully spread out to your time window. There may be times when Mailshake has a lot of emails to get out in a short period of time. For instance, if you add a big batch of recipients to be sent and we're almost at the end of your time window for the day, this setting can make sure Mailshake doesn't try to jam them all through at once.